1 CAPARAY simulates the effects of layering in the ocean bottom on the propagation of a broadband signal. The ocean bottom is characterized by a geoacoustic profile that includes compressional and shear velocities, density and compressional wave attenuation. Velocity profiles that allow the derivation of analytic expressions for a ray's range, travel time and attenuation are used in the ocean and in the bottom layers. A transfer function representing the total effect of the environment is constructed from the characteristics of each eigenray. The receiver time series is generated using a linear systems approach (Westwood and Vidmar, 1987). 2 FACT combines ray theory with higher-order asymptotic corrections near caustics to generate TL in range-independent ocean environments (Baker and Spofford, 1974; Spofford, 1974; Jacobs, 1982; McGirr et al, 1984; Holt, 1985; King and White, 1986a,b). 3 FLIRT provides estimates of bottom-bounce and CZ TL using linear ray-tracing methods (McGirr and Hall, 1974). 4 GAMARAY is a multi-frequency (broadband) extension to the ray-theoretical approach (Westwood, 1992). 5 ICERAY is an extension of CAPARAY that includes layers above the ocean surface to model propagation in the ice. Three types of ray paths are included in the model: (1) compressional rays; (2) shear vertical rays in the upper layer that are converted at the water-ice interface from (or to) compressional rays in the water; and (3) a ray form of the evanescent shear or compressional field in the upper layers (Stotts and Bedford, 1991; Stotts et al, 1994). 6 PLRAY is a ray propagation loss program applicable to a horizontally stratified ocean with a flat bottom. It contains a surface duct model based on a simplified approximation to mode theory, which replaces ray computations when the sources and receivers are located in a surface duct (Bartberger, 1978a). 7 RANGER is a package of acoustic ray propagation programs used as research tools for bottom-interaction studies. These programs assume an ocean environment that is horizontally stratified with respect to sound speed and water depth (Foreman, 1977). 8 ACCURAY uses complex ray methods to find the field due to a point source in the presence of a single plane, penetrable interface (Westwood, 1989b). This method has been applied to the Pekeris (flat, isovelocity) waveguide and to a sloping, isovelocity (penetrable wedge) waveguide. 9 BELLHOP computes acoustic fields in range-dependent environments (Porter, 1991) via Gaussian beam tracing (Porter and Bucker, 1987) [also see the updated summary of SACLANTCEN models by Jensen et al (2001)]. 10 Coherent DELTA is an extension of a ray-theoretic algorithm developed by A.L. Piskarev, which computes acoustic intensity without calculating eigenrays or focusing factors in caustics. The original algorithm has been modified to sum ray contributions coherently in a range-dependent environment (Dozier and Lallement, 1995). 11 FACTEX extends the FACT model to range-dependent environments by adiabatic mapping of ray families over a sequence of sound-speed profiles with associated bathymetry (Garon, 1975). 12 GRAB computes high-frequency (10-100 kHz) TL in range-dependent, shallow-water environments. The model is based on Gaussian ray bundles, which are similar in form (but somewhat simpler) than Gaussian beams (Weinberg and Keenan, 1996; Keenan, 2000; Keenan and Weinberg, 2001). The US Navy standard GRAB model (under OAML configuration management) is a subset of CASS (Keenan et al., 1998). 13 GRASS utilizes a ray-tracing technique involving iteration along the ray path to compute TL in range-dependent ocean environments (Cornyn, 1973a,b). 14 HARORAY is a 2D broadband propagation model based on ray theory. This code was written to provide synthetic waveforms to simulate signals used in the Haro Strait coastal-ocean processes experiment (June 1996). The model uses a single point source and a vertical array of receivers. The speed of sound in the water column and bottom layers is homogeneous in depth but variable in range (Pignot and Chapman, 2001). 15 HARP O numerically integrates Hamilton's equations in three dimensions. Transmission loss is calculated by computing 3D ray divergence and complex reflection coefficients at the upper and lower boundaries, and by numerically integrating absorption (Jones, 1982; Jones et al., 1982, 1986; Weickmann et al., 1989; Georges et al. 1990; Newhall etal., 1990; Harlan et al, 1991a,b; Jones and Georges, 1991). 16 HARVEST is a general hybrid technique that solves the 2D acoustic-viscoelastic equations for bottom-interacting acoustics in water depths exceeding 1 km in the frequency range 100-500 Hz. The model comprises three methods: a Gaussian-beam method is used to propagate the source wave field vertically through the water column; a viscoelastic, finite-difference grid is used to compute the complex acoustic-anelastic interaction of the incident wave field with the rough sea floor; and the backscattered wave field is extrapolated to a distant receiver array using the Kirchhoff integral (Robertsson et al, 1996). 17 LYCH calculates TL on the basis of ray tracing in an environment where both sound speed and bathymetry vary as functions of range (Plotkin, 1996). 18 MEDUSA is a ray theoretical model intended for range-dependent, azimuthally symmetric ocean environments. The model uses modified cubic splines to fit the bathymetry and sound-speed profiles with smooth curves, thus eliminating false caustics and shadow zones (Foreman, 1982, 1983). 19 MIMIC is a wave-like ray summation model that treats propagation at low frequencies (< 150 Hz) and short ranges (<CZ ranges) in range-dependent ocean environments. The environment is modeled as a water column overlying a sedimentary seabed with an acoustically hard bottom (Ocean Acoustic Developments Ltd, 1999b). 20 MPC is a real-time model for engineering applications, particularly training simulators. Surface duct and CZ caustic calculations are performed by the FACT model while the methods of the RAYWAVE model are used to transition across ocean frontal zones (Miller, 1982, 1983). 21 MPP is a ray-theoretical model that accommodates range-dependent environments using constant-gradient sound-speed layers with a triangular profile interpolation system (Spofford, 1973a; Jacobs, 1974). 22 Pedersen is a ray-theoretical model that uses multiple sound-speed profiles above the sound channel axis, flat bathymetry and bottom loss inputs to compute TL as a function of range. The individual sound-speed profiles are fit by segments with continuous slopes (Pedersen et al., 1962; Gordon, 1964). 23 RAYWAVE generates long-range TL values in ocean environments where sound speed, bottom depth and boundary losses may vary significantly along the transmission path. RAYWAVE computes sound speed as a function of depth and range by using triangular regions between adjacent profiles. The prototype RAVE model of Bucker (1971) was the starting point for the development of RAYWAVE (Watson and McGirr, 1975). 24 RP-70 is a long-range ray-theoretical model that allows for changing sound-speed profiles and bottom depth over the propagation track. The TL routines utilize an adjacent-ray approach and provide loss values based on incoherent signal addition. An interpolation routine computes intermediate sound speed points, and a linearly segmented bottom-depth profile is used. Absorption can also be made to vary along the propagation path (Colilla, 1970; Harding, 1970). 25 SHALFACT is a special version of the FACT model designed for use in shallow-water environments by allowing for a sloping (flat) bottom (Garon, 1976). Contributions from surface-reflected and bottom-reflected paths are made using a rapidly computed analytic expression that represents the average acoustic field. 26 TRIMAIN is a ray-theoretical model that divides the range-depth plane into triangular regions (Roberts, 1974). Interpolation of sound speed (c) within each triangle is performed by making 1/c2 linear in depth and range. The rays are assumed to be parabolic in each triangle. 11 AP2 is a normal-mode model based upon the Pekeris branch cut in the complex plane, an infinite sum of normal modes and a branch line integral. AP5 is a normal-mode model similar to AP2 but with a geophysical bottom approximated by up to five sediment layers containing sound-speed and attenuation gradients overlying a homogeneous semi-infinite basement layer characterized by a shear wave speed (Bartberger, 1978b). 28 BDRM extends the WKBZ model to include beam-displacement ray-mode theory. These extensions permit calculation of pulse propagation in shallow water as well as extensions to elastic bottom boundaries (Zhang and Li, 1999; Liu et al., 2001). 29 COM ODE is a normal-mode model that treats bottom attenuation exactly using complex eigenvalues (Gilbert et al., 1983). 30 DODGE uses the effective-depth method to determine the normal modes in a shallow-water channel. Using equations developed from simple arguments, the grazing angle and phase speed of each propagating mode are easily determined (Ward, 1989). The effective-depth method (Weston, 1960) replaces the actual seabed (at depth H) with a pressure-release surface at an effective depth (He) below the surface. 31 FNMSS is a normal-mode model that computes boundary losses due to surface scattering (Gordon and Bucker, 1984). Empirical scattering tables for Arctic pack ice are optional. 32 MODELAB is an efficient and numerically robust algorithm for calculating acoustic normal modes in a fluid-layered ocean. Each layer has a sound-speed profile for which the mode functions can be expressed analytically in terms of Airy functions. Attenuation is included as a perturbation. The form of the propagator matrices avoids the numerical instabilities associated with evanescent fields (Levinson et al., 1995). 33 NEMESIS is a low-frequency model designed to compute eigenvalues and normal modes in a horizontally stratified deep ocean with single-channel profiles and multiple fluid sediment layers overlying a substrate. Sound speeds in the water and sediment vary with depth, although the density is constant within each layer. The last layer is a homogeneous, semi-infinite fluid or solid substrate in which the compressional and shear speeds (and density) remain constant with depth (Gonzalez and Hawker, 1980; Gonzalez and Payne, 1980). 34 NLNM is a normal-mode model for ideal layered media. User-assisted mode selection permits flexibility, but requires user familiarity with mode structures (Gordon, 1979). This model is an extension of the two-layer model of Pedersen and Gordon (1965). 35 NORMOD3 is a normal-mode model that uses a finite-difference algorithm (Blatstein, 1974). This model is based on the earlier model by Newman and Ingenito (1972). 36 NORM2L calculates the discrete normal modes and acoustic propagation loss for the Pekeris model of the ocean, a simple two-layer model in which the water and seabed have constant acoustic properties (Ellis, 1980). The user interactively enters the frequency, water depth, sound speed and density for the two layers, and the absorption coefficient for the bottom layer. 37 ORCA uses a normal-mode method to model propagation in acousto-elastic ocean waveguides. The model assumes horizontally stratified layers in which the sound speed (c) is either constant or varies linearly in 1 jc1. Multiple-duct environments are handled, and short-range propagation is accurately modeled by including leaky modes in the mode summation. Seismic interface modes such as the Scholte and Stonely modes are also computed. The model uses analytic solutions to the wave equation in each layer: Airy functions for gradient layers and exponentials for isospeed layers (Westwood et al., 1996) [also see the PROSIM model, which is based in part on ORCA. Tolstoy (2001) compared the performance of the ORCA, KRAKEN and PE models against a reference solution generated by the SAFARI model. All three models were highly accurate (mostly within 1 dB of the reference solution) for range-independent environments]. 38 PROTEUS is a multi-frequency (broadband) extension to the normal-mode approach (Gragg, 1985). 39 SHEAR2 extends the standard Pekeris waveguide model (homogeneous layer of fluid overlying an infinite homogeneous fluid half-space of greater sound speed) to handle the case of a fluid overlying an elastic basement in which the shear speed is less than the compressional speed of sound in the fluid. This gives rise to leaky modes in which both the mode eigenfunctions and eigenvalues are complex (Ellis and Chapman, 1985). 40 Stickler is a normal-mode model that computes the continuous as well as the discrete modal contributions (Stickler, 1975; Stickler and Ammicht, 1980; Ammicht and Stickler, 1984). The determination of the continuous spectrum to the TL is performed using a uniform asymptotic method that avoids costly numerical evaluation. However, the improper eigenvalues must be found. 41 ADIAB is an adiabatic normal-mode program that conserves energy using a consistent boundary-condition approximation (R.A. Koch, unpublished manuscript). Milder's (1969) criterion is used to test the amount of coupling per mode-cycle distance. 42 ASERT uses the ASTRAL model, together with specialized databases, to generate multi-radial portraitures of ocean acoustic TL (Lukas et al., 1980a). 43 ASTRAL assumes adiabatic invariance in propagating mode-like envelopes through a range-dependent environment (Blumen and Spofford, 1979; Spofford, 1979; Dozier and White, 1988; White et al, 1988; White, 1992; White and Corley, 1992a, b). 44 CENTRO is an adiabatic normal-mode model that includes absorptive effects and elastic waves in the ocean floor (Arvelo and Überall, 1990). The source is located in the water column, while the receiver may be located either in the water or in the elastic medium. 45 CMM3D is a 3D, coupled-mode model (Chiu and Ehret, 1990, 1994) that is based on the earlier work of Pierce (1965). This model has been interfaced with data generated by an ocean circulation model to examine 3D environmental effects on sound transmission through intense ocean frontal systems. 46 COUPLE utilizes a stepwise-coupled-mode method that overcomes the failure of previous coupled-mode techniques to properly conserve energy over sloping bottoms. This method of stepwise-coupled modes avoids problems associated with sloping bottoms by using only horizontal and vertical interfaces. The full solution includes both forward and backscattered energy (Evans, 1983, 1986; Evans and Gilbert, 1985). 47 CPMS combines a conventional coupled-mode solution with perturbation theory to provide fast and accurate solutions of TL in range-dependent ocean environments. The efficiency of the coupled-mode solution is improved by removing the need to solve the depth-separated wave equation for the normal modes at each range step. Specifically, the normal modes are found by applying perturbation theory to the modes of the previous step (Tindle et al., 2000). 48 FELMODE is a standard normal-mode model that considers an ocean environment consisting of three layers: water column, sediment layer and homogeneous half-space. Density and attenuation in all layers are independent of depth, although attenuation is a function of frequency. The sound speed in the water column and sediment varies with depth while it remains constant in the half-space. Finite-difference discretization is used to solve the modal equation and its boundary conditions. Only discrete modes are calculated, omitting the continuous spectrum. Volume-attenuation losses in the water, sediment and half-space are incorporated by first-order perturbation theory. Shear in the bottom layers is ignored. Range-dependent ocean environments are handled by using the adiabatic approximation. The model was developed in MATLAB with a user-friendly GUI (Simons and Laterveer, 1995; Simons and Snellen, 1998). 49 Kanabis is a normal-mode model appropriate for low-frequency, long-range propagation in shallow-water regions (Kanabis, 1975, 1976). 50 KRAKEN is a normal-mode model that handles range dependence through either adiabatic coupling or full forward mode coupling between environmental provinces (Porter and Reiss, 1984, 1985; Porter, 1991). KRAKEN is recommended for more experienced modelers or for those requiring a 3D capability [the original KRAKEN algorithm was incorporated into the SNAP model, whereupon SNAP was renamed SUPERSNAP. Since 1984, SUPERSNAP became a standard model at SACLANTCEN and is now simply referred to as SNAP (Porter, 1991). Also see the updated summary of SACLANTCEN models by Jensen et al. (2001)]. 51 MOATL computes TL on the basis of the discrete normal modes that propagate in the water column. 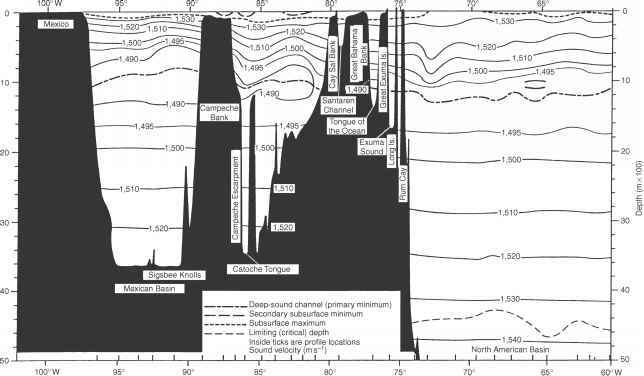 The sound-speed profile in the water is arbitrary, and the ocean bottom consists of a sediment layer with arbitrary sound-speed profile and an underlying uniform fluid or solid sub-bottom (Miller and Ingenito, 1975; Ingenito et al, 1978; Miller and Wolf, 1980). 52 MOCTESUMA is a coupled normal-mode model developed by Thomson Sintra, Activités Sous Marines, France (Dr Alain Plaisant). There are two versions: one for 2D environments with fluid-elastic sediments and one for 3D environments with fluid sediments (Noutary and Plaisant, 1996; Papadakis et al., 1998). 53 NAUTILUS is a broadband, range-dependent normal-mode model based on the adiabatic formulation. This model is designed for use in shallow water and is currently under review by OAML for designation as a US Navy configuration-managed model. The mode-generating engine is derived from the MODELAB model (Koch and LeMond 2001 a-c; Koch and Knobles, 1995). 54 PROLOS is a normal-mode propagation loss program that uses the adiabatic approximation to model an environment in which the sound-speed profile, water depth and bottom properties vary slowly with range. PROLOS can handle up to ten layers in the bottom and used up to 500 layers to interpolate the sound-speed profile in the water column. The normal-mode equations are solved using a two-ended shooting technique borrowed from quantum mechanics and generalized to include the effects of density. Shooting from both ends results in a more stable algorithm and gives more accurate eigenfunctions than those obtained from conventional one-ended shooting methods (Ellis, 1985). 56 SHAZAM is a normal-mode model with both adiabatic and coupled-mode solutions for application to shallow-water environments (Navy Modeling and Simulation Management Office, 1999). 57 SNAP is a normal-mode model based on a computer program originally developed at the US Naval Research Laboratory (Miller and Ingenito, 1975; Ingenito et al., 1978). Solutions are found only for the discrete part of the spectrum corresponding to the propagating modes. Losses are introduced in a perturbational manner. Slight range dependence is handled in the adiabatic approximation (Jensen and Ferla, 1979). C-SNAP is a coupled-mode version of SNAP (Ferla et al., 1993). The numerical solution technique for one-way mode coupling was obtained from KRAKEN. When the original KRAKEN algorithm was incorporated into the SNAP model, SNAP was renamed SUPERSNAP. Since 1984, SUPERSNAP became a standard model at SACLANTCEN and is now simply referred to as SNAP (Porter, 1991 ) [also see the updated summary of SACLANTCEN models by Jensen et al. (2001 )]. 58 WEDGE calculates downslope propagation using a 2D representation of the continental slope and realistic environmental parameters (Primack and Gilbert, 1991). Numerical implementation is divided into two parts: (1) pre-calculation of local modes and (2) mode manipulation. This wedge-mode model is limited to geometries where the propagation can accurately be predicted using only trapped modes. Wedge modes are the intrinsic normal modes in the wedge coordinate system. 59 WKBZ is an adiabatic normal-mode model based on a uniform WKB approximation to the modes (Zhang et al., 1995). 60 WRAP uses adiabatic and coupled-mode theory for rapid computation of acoustic fields in 3D ocean environments (Perkins et al., 1990; Kuperman et al., 1991). 61 3D Ocean expresses the solution of the reduced wave equation for an almost stratified medium in the form of an asymptotic power series. The vertical structure of the solution is expressed as a linear combination of the normal-mode eigenfunctions whose coefficients satisfy 2D eikonal and transport equations (Weinberg and Burridge, 1974). 62 FAME is based upon the multipath expansion for acoustic propagation in a horizontally stratified ocean. The multipaths are expressed in terms of Fresnel integrals and effective range derivatives (Weinberg, 1981). 63 MULE is a multi-frequency (broadband) extension to the multipath expansion method (Weinberg, 1985a). 64 NEPBR modifies the RAYMODE model to account for frequency smearing in the narrowband spectrum (McCammon and Crowder, 1981). 65 RAYMODE is a hybrid technique combining elements of ray theory and normal-mode theory to compute TL in range-independent ocean environments (Leibiger, 1968; Yarger, 1976, 1982; Medeiros, 1982a, 1985a; Almeida and Medeiros, 1985; Naval Oceanographic Office, 1991a,c) (the RAYMODE model is discussed in detail in Section 4.8). 66 FFP applies fast Fourier transform methods to acoustic field theory to obtain TL as a function of range (DiNapoli, 1971; DiNapoli and Deavenport, 1980). 67 Kutschale FFP is a rapid and accurate method for calculating TL in the ice-covered Arctic Ocean. Input parameters include source and detector depths, frequency, ice roughness bottom topography and the sound velocity structure as a function of depth in the ice, water and bottom. Computation is performed by direct integration of the wave equation derived from a harmonic point source located in a multilayered, interbedded liquid-solid half-space. The integration method introduced by H.W. Marsh employs the FFT for rapid evaluation of the integral solution (Kutschale, 1973). 68 MSPFFP, or multiple scattering pulse FFP (Kutschale, 1984), models bottom-interacting pulses corresponding to the coherent summation of many modes over a limited time interval. Specifically, MSPFFP decomposes the Kutschale (or pulse) FFP model (Kutschale, 1973; Kutschale and DiNapoli, 1977) into ray-path contributions. Each decomposed term can then be interpreted as the desired path contribution for a corresponding bottom-interacting pulse. The FFP algorithm directly integrates the full-wave solution. Temporal waveforms are computed by Fourier synthesis. 70 Pulse FFP is a time-marched fast-field program for modeling acoustic pulse propagation in the ocean (Porter, 1990). 71 RPRESS uses a high-order, adaptive integration method for efficient computation of the Hankel-transform integral for the wave field in a laterally homogeneous fluid-solid medium (Ivansson and Karasalo, 1992). This model has been used to investigate frequency-dependent propagation losses in shallow water caused by shear losses in the sediment (Ivansson, 1994). 72 SAFARI is based on the wavenumber integration technique (or fast field program) to solve the wave equation exactly for strictly range-independent environments (Schmidt and Glattetre, 1985; Schmidt, 1988). The model includes propagation of waves in fluid and solid media by discretizing the environment into layers with different acoustic properties. The Green's function is evaluated analytically within each layer and the boundary conditions are fulfilled at each layer interface by using a numerically stable direct-global-matrix approach. SAFARI consists of three independent models: FIPR to compute the plane-wave complex reflection coefficient due to an arbitrarily layered medium; FIP for general single frequency wave propagation; and FIPP for pulse propagation. An updated version of SAFARI called OASES (discussed above) is available on the Web [also see the updated summary of SACLANTCEN models by Jensen et al. (2001)]. 73 SCOOTER is a finite-element FFP code for computing acoustic fields in range-independent environments. It is recommended for use when the horizontal range is less than ten water depths (Porter, 1990). 74 SPARC is a time-marched FFP model that treats problems dealing with broadband or transient sources (i.e. pulses) (Porter, 1990, 1991). 75 CORE is a coupled version of OASES for range-dependent environments. It belongs to the new spectral super-element class of propagation models for range-dependent waveguides. This approach is a hybridization of the FE and BEM. The ocean environment is divided into a series of range-independent sectors separated by vertical interfaces (Goh et al., 1997). 76 RDFFP utilizes a generalized Green's function method for solving the one-way wave equation exactly in an ocean environment that varies discretely with range. An explicit marching solution is obtained in which the source distribution at any given range step is represented by the acoustic field at the end of the previous step (Gilbert and Evans, 1986). 77 RD-OASES is a range-dependent version of OASES (Schmidt, 1999). RD-OASES extends to fluid-elastic stratifications the development of a spectral super-element approach for acoustic modeling in fluid waveguides using a hybridization of FE, boundary integrals and wave-number integration to solve the Helmholtz equation in a range-dependent ocean environment. The ocean environment is divided into a series of range-independent sectors separated by vertical interfaces. This model provides accurate, full two-way solutions to the wave equation using either a global multiple scattering solution or a single-scatter, marching solution. 79 RDOAST refers to the specific combination of RD-OASES and VISA (Goh and Schmidt, 1996). The virtual source algorithm (VISA) uses the marching, local single-scatter approximation to the transmission and reflection problem at the sector boundaries; thus, a virtual array of sources and receivers is introduced on each sector boundary, (http://acoustics.mit.edu/arcticO/henrik/www/rd_oases.html). 80 SAFRAN uses a hybrid combination of wavenumber integration and Galerkin BEM to extend the fast-field theory technique to range-dependent ocean environments (Seong, 1990). Use single environmental specification with range-dependent model. 81 AMPE was developed to solve global-scale ocean acoustic problems that are too large to solve with other existing 3D codes. The PE method was used to solve 2D wave equations for the adiabatic mode coefficients over latitude and longitude (Collins, 1993d). CMPE is a generalization of AMPE that includes mode-coupling terms. It is practical to apply this approach to large-scale problems involving coupling of energy between both modes and azimuths (Abawi et al., 1997). 82 CCUB/SPLN/CNP1 represent a family of higher-order, finite-element PE methods developed by the Foundation for Research and Technology - Hellas, Institute of Applied and Computational Mathematics, Greece (Papadakis et al., 1998). 83 Corrected PE solves the PE using the split-step algorithm. (Perkins and Baer, 1978; Perkins et al., 1982). By assuming cylindrical propagation symmetry, it is possible to simulate a tilted acoustic array placed in the calculated complex-valued acoustic field. 84 DREP is a wide-angle PE based on an operator-splitting that permits the use of a marching type Fourier transform solution method (Thomson and Chapman, 1983; Thomson, 1990). 85 FDHB3D is a hybrid 3D, two-way propagation model for solving 3D backscattering problems. It is based on the IFD PE approach (Zhu and Bjorno, 1999). 86 FEPE computes the complex acoustic pressure in range-dependent ocean environments. The model solves higher-order parabolic equations using a numerical solution based on Galerkin's method, alternating directions and Crank-Nicolson integration (Collins, 1988a). The model allows arbitrary sound-speed, density and attenuation profiles. FEPE provides several options for the initial starting field including the Gaussian PE starter (Tappert, 1977) and Greene's (1984) PE starter. 87 FEPE-CM combines the FEPE code with the PERUSE surface scattering formulation to model the forward scattering from both periodic and single realizations of randomly rough sea surfaces. A conformal mapping technique converts the rough-surface scattering problem into a succession of locally flat-surface problems (Norton etal., 1995). Norton and Novarini (1996) used FEFE-CM to investigate the effect of sea-surface roughness on shallow-water waveguide propagation. 88 FEPES extends the FEPE model to handle range-dependent elastic media (Collins, 1993b,c). This energy-conserving, elastic PE model is applicable to a large class of problems involving waveguides consisting of both fluid and solid layers. 89 FOR3D implements the Lee-Saad-Schultz (LSS) method for solving the 3D, wide-angle wave equation (Botseas et al., 1987; Lee et al., 1988, 1992). The model is designed to predict TL in ocean environments that vary as functions of range, depth and azimuth. 90 HAPE implements the rational-linear approximation in a finite-difference formulation to provide accurate treatment of high-angle propagation to angles of about 40° with respect to the horizontal (Greene, 1984). A rational approximation to the square-root operator was first suggested by Claerbout (1976: 206). This approximation reduced the phase error problem inherent in the original, narrow-angle PE models that had been limited to about 15° [note: more recent, higher-order PE implementations have virtually eliminated the phase error problem and are accurate for propagation angles of nearly 90°]. 91 HYPER is a hybrid parabolic equation-ray model intended for high-frequency applications (Tappert et al., 1984). 92 IFD wide angle implements an implicit finite-difference scheme for solution of the PE (Lee and Botseas, 1982; Botseas et al., 1983). This model can handle arbitrary surface boundary conditions and an irregular bottom with arbitrary bottom boundary conditions. 93 IMP3D extends the FOR3D model by including a simplified elastic impedance bottom boundary condition (Papadakis et al., 1998). 94 LOGPE uses a logarithmic expression for the index of refraction in the standard PE in order to closely approximate solutions of the more exact Helmholtz equation in weakly range-dependent ocean environments (Berman et al., 1989). 95 MaChl is a broadband, range-dependent acoustic propagation model based on the one-way form of the Maslov integral representation of the wave field. The one-way propagation assumption may be combined with a parabolic approximation (Brown, 1994). 96 MOREPE is an energy-conserving parabolic equation that can handle relatively large variations in the index of refraction (Schurman et al., 1991). 97 OS2IFD is a full-featured version of IFD parabolic equation that runs on personal computers (PCs) under the OS/2 operating system (Robertson et al., 1991). 98 PAREQ is a PE model based on the split-step algorithm (Jensen and Krol, 1975). This model is a modified version of the one developed by AESD (Brock, 1978) [also see the updated summary of SACLANTCEN models by Jensen et al. (2001)]. 99 PDPE is a pseudodifferential PE model. The documentation contains a numerical algorithm for its implementation (Avilov, 1995). 100 PE is based on the original algorithm developed by Hardin and Tappert (1973) and Tappert (1977). The original US Navy version was implemented by Brock (1978). Upgrades have been reported by Holmes (1988) and by Holmes and Gainey (1992a-c). A version of this model can accommodate ice-covered regions. 101 PECan is an N x 2D/3D parabolic equation model for underwater sound propagation that was developed for matched-field processing applications (Brooke et al, 2001). 102 PE-FFRAME applies the FE method to produce a full-wave, range-dependent, scalar, ocean acoustic propagation model (Chin-Bing and Murphy, 1988; Murphy and Chin-Bing, 1988). The term "full wave" includes the continuous and discrete spectra, forward propagation and backscatter. The model can be given a long-range capability through super elements or marching frames. 103 PESOGEN is a special-purpose microcomputer model used to compute the acoustic field in a fully range-dependent environment over a wide range of frequencies for both deep-water and shallow-water regions with greatly reduced execution times (Nghiem-Phu et al., 1984). 104 PE-SSF (UMPE/MMPE): MMPE and its predecessors, UMPE (Smith and Tappert, 1993) and MIPE, are now collectively referred to as PE-SSF (parabolic equation-split-step Fourier algorithm). PE-SSF thus represents a wide class of PE models (Tappert, 1998). 105 RAM incorporates an improved elastic PE (Collins, 1998) together with a stable self-starter (Cederberg and Collins, 1997). A companion version called RAMS is available for acousto-elastic problems. Both RAM and RAMS use the split-step Pade solution, which is approximately two orders of magnitude faster than the Crank-Nicolson solution of the wide-angle PE (Collins, 1993a). 106 SNUPE achieves linearization of the depth-direction operator by expansion into a multiplicative Pade approximation. Galerkin's method is used for computational efficiency to approximate the depth-direction equation. Crank-Nicolson's method is used to approximate the range-direction equation. A numerical self-starter initiates the near-field solution (Seong and Choi, 2001). 107 Spectral PE extends the two-way PE to 3D problems involving a point source in a waveguide in which the acoustic properties vary with depth and range (Orris and Collins, 1994). This model presents an efficient approach for solving backscattering problems that are separable in one of the horizontal Cartesian coordinates, including backscattering from extended features such as ridges. 108 TDPE is the inverse Fourier transform of the wide-angle PE (Collins, 1988b). 109 Two-way PE generalizes the PE to handle backscattered acoustic energy in the ocean (Collins and Evans, 1992). The two-way PE is based on the single-scattering approximation and the approach of the two-way coupled modes in which range-dependent environments are approximated by a sequence of range-independent regions. The outgoing and incoming fields are propagated by two-way range marching. 110 ULETA is based on Tappert's (1977) PE model. ULETA generates transmission losses for single frequency (CW) or pulse sources in range-dependent ocean environments (Palmer et al., 1988b). 111 UNIMOD is a hybrid combination of PE (for waterborne energy) and FACT or MPP for bottom-interacting energy (R.B. Lauer, unpublished). 112 3DPE (NRL-1) solves the 3D PE using the split-step algorithm (Perkins and Baer, 1982; Perkins et al., 1983). The input sound-speed profiles and bathymetry need not be specified on a regular grid. However, interpolation schemes based on user-supplied triangularizations of the region are employed. Three graphic outputs can be produced: (1) TL versus range (with depth and azimuthal angle held fixed); (2) TL versus depth (with range and azimuthal angle held fixed); and (3) TL versus azimuthal angle (with range and depth held fixed). An additional program can simulate the performance of a horizontal acoustic array at given ranges. 113 3DPE (NRL-2) handles wide propagation angles in depth, narrow propagation angles in azimuth and rough boundaries (Collins and Chin-Bing, 1990). 114 3D TDPA uses one-way narrow-angle and wide-angle, 3D, time domain paraxial approximations to simulate pulse propagation in 3D ocean geometries characterized by volume attenuation and variable density (Orchard et al., 1992).